Rapid advances in technology require materials with improved property profiles. Polymer modification using grafting and crosslinking are key ways to achieve this in an economical way and without the need for developing new materials. 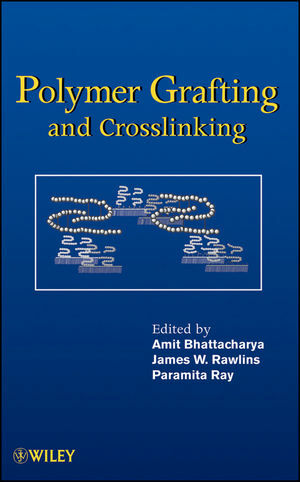 Often widely disparate and in a number of references, practical information on polymer grafting and crosslinking is now available in one volume. Researchers seeking information that bridges the knowledge gap between the scientific principles and industrial applications of polymer crosslinking and grafting will find coverage on the basic science, the methodologies, and a focus on the specific techniques used in a variety of industrial applications such as automotive, laminates, paints, adhesives, and cable. Coverage also includes potential biomedical applications. Descriptions of analytical tools that can be used to evaluate the results are also included. Amit Bhattacharya is a scientist in the Reverse Osmosis Division of the Central Salt and Marine Chemicals Research Institute in Gujarat, India. James W. Rawlins is an Assistant Professor of Polymer Science and Engineering at the University of Southern Mississippi. Paramita Ray is a scientist in the Reverse Osmosis Division of the Central Salt and Marine Chemicals Research Institute in Gujarat, India. Introduction (Amit Bhattacharya and Paramita Ray). 2. Basic Features and Techniques (Amit Bhattacharya and Paramita Ray). 3. Mechanism and Kinetics (Chris Fellows). 4. Analytical Evidences (Amit Bhattacharya and Paramita Ray). 5. Broader Spectrum: Examples (Inderjeet Kaur and Paramita Ray). 6. In Biomedical Arena (Gauri Misra, Eun Gil, and Tao Lowe). 7. Application in Textiles (Mohammed Rahman). 8. In Automobiles (James Rawlin and Jeremy Swanson). 9. In Cable Technology (Achintya Sen). 10. Separation and purification (Mohamed Nasef). 11. Coatings, Adhesives, and Laminates (James Rawlin and Sharath K. Mendon).